After training and testing at Pearl was complete the crew embarked for Bowfin’s seventh war patrol on 25 January 1945. This patrol largely took place in the waters east of the Japanese mainland; and Bowfin’s secondary assignment was lifeguard duties to assist with the many air raids being conducted by our B-29s. On 17 February, vessels believed to be destroyers were detected. Bowfin set up to attack and fired three torpedoes from the bow tubes. One hit the target and an enormous explosion sent the destroyer high into the sky. The other torpedoes did not hit, and the other destroyer proceeded to drop 26 depth charges on Bowfin. After the charges were dropped Bowfin set up to attack again and fired three more torpedoes at the destroyer. One of the torpedoes fired prematurely, and the other two missed the target. When Bowfin surfaced to check the scene out they had lost contact with the destroyer; smoke was sighted instead and they made a beeline to the source. The sun was rising, and a slightly damaged schooner came into view. Seizing the opportunity, the crew shot at it with their deck guns. The boat was hauling several depth charges, presenting the perfect target for Bowfin. The deck guns turned the depth charges, meant for US submarines, into a catastrophic explosion sending the schooner to the depths. After sinking the schooner Bowfin returned to await the US Army Air Corps airmen in their upcoming raids. On 19 February Bowfin was stationed at the assigned lifeguard position while B-29s performed a raid on the Japanese mainland, this duty was given to many submarines during the war saving countless American lives. On 4 March while in their patrol area, Bowfin encountered two picket boats of about 300 tons. Bowfin took the opportunity to save some torpedoes and fired at them with their deck guns. Soon the enemy was returning effective fire and one of the crew members was hit. He was the only Bowfin crew member to ever be injured while on patrol; Torpedoman’s Mate, Second class R.E. Lee was hit by in the leg by shrapnel. The two picket boats proved to be more difficult to sink than anticipated, so the Captain submerged and maintained contact with the boats using sonar, but continued on with their lifeguard duties. On 18 March Bowfin sighted a large object falling out of the sky towards the water. Upon closer inspection they saw that it was a strange balloon about 30 feet in diameter. They shot at it to deflate it, and grabbed it out of the water. These types of balloons were used by the Japanese for intelligence gathering information. The next day Bowfin received information concerning a plane going down near their position. They were very close to the position and saw the plane go down with the tail destroyed. It made a water landing near the submarine and the crew rescued the two airmen of a torpedo bomber. Lieutenant R.U. Platt and Aviation Machinist Mate, third class J. Papazoglavis of Torpedo Squadron 83 were welcomed aboard Bowfin with open arms. With the rescue complete, Bowfin finished her seventh war patrol on a high note in Guam. USS Bowfin was underway for 14,325 miles during her seventh patrol. CDR Tyree and higher authorities believed Bowfin sank 2,950 tons (two vessels). JANAC credited USS Bowfin with sinking 750 tons (one vessel of that tonnage plus one small craft). CDR Tyree was awarded the Navy Cross. 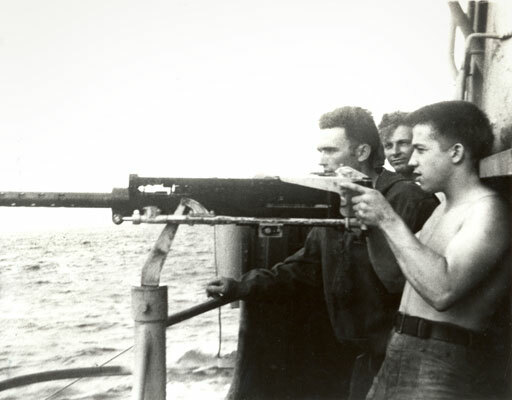 Bowfin crew members manning one of the 50 caliber guns. The U.S. 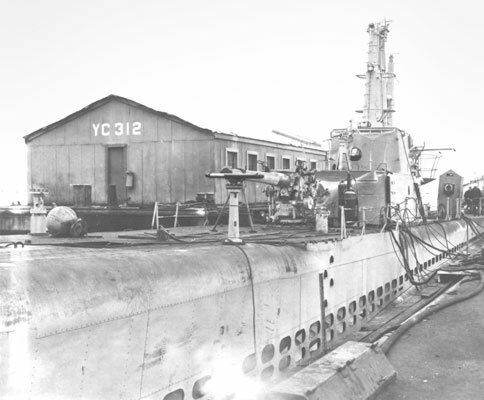 Submarine Service was created in 1900 and the first submarine was the USS Holland, named for the man who designed and developed it.